The dual nomination of Meg Whitman and Carly Fiorina for governor and U.S. Senate in the state Republican primary was an historic event, but the candidates’ gender is unlikely to help them much in the November election. – Party matters far more than gender in a general election. – Neither Democratic nor independent women voters are likely to favor a candidate who is not pro-choice. “Party, party, party,” answered Mark DiCamillo, director of the esteemed Field Poll, when asked if a candidates’ gender or partisan identification is more important in a general election. In a late October Field Poll of the 1990 governor’s race, then-Republican Senator Pete Wilson led Feinstein, the former longtime mayor of San Francisco, by 47-39%, with 14% for others or undecided. At the time, he not only led 48-36% among men, who comprised 48 % of the electorate, but also 46-40% among women, who represented 52% of all voters. At the time, Feinstein enjoyed relatively modest support within her own party, leadin g only 62-24% among Democrats. Wilson by contrast, led 76-12% among Republicans. Days later, Wilson won the election 49-46%, as Feinstein gained considerable ground in the final days of the campaign; while there was no reliable exit poll on the race, it appears that many Democrats (a disproportionate number of whom are women), who had earlier held back, broke for their party’s candidate in the end. Statistical support for that conclusion may be found in Los Angeles Times exit polling of the governor’s race four years later. State Treasurer Kathleen Brown – the weakest Democratic candidate for governor in recent history – won 78% of her party’s vote in a bid against incumbent Gov. Pete Wilson, according to the survey. If Brown captured nearly eight in 10 Democrats in winning only 41% of the overall vote in 1994, it’s certain that Feinstein won at least as many with her stronger statewide performance four years earlier. The 1994 Kathleen Brown-Pete Wilson race and the Feinstein-Michael Huffington Senate race the same year also offer clues about the relationship of party, gender and the abortion issue. The pro-choice Wilson beat pro-choice Brown statewide by a resounding 55-41%. According to the Times exit poll, Wilson carried men 58-38% and women 52-43%, meaning Brown did somewhat better with women than with men. But the numbers show that nearly all of the gender difference is explained by party. Wilson won Republican men and women by 91-6% each and also carried independents: 57-34% among men and 54-39% among women; as she did among Democrats, Brown did somewhat better among independent women than she did with independent men. Independents represented only about 16% of the electorate in 1994 (they are about 20% today). Brown’s pick-up of overall women voters was based on winning Democrats 78-19%, in a year when Democrats accounted for more than 4 in 10 voters (Democrats are now 44% of registered voters) and the party’s voting ranks included considerably more women than men. Like Wilson, Huffington was pro-choice. Feinstein won 83% of Democratic men and 84% of women Democrats, while Huffington carried 83% of GOP men but just 75% of the party’s women. She won independent women, 51-36%, while independent men favored him 44-39%. So Feinstein ran stronger with women voters than men, both among Republicans and independents – even though both candidates were pro-choice. This shows that it’s possible for a Democratic woman to pull some votes from the opposite party and from independents based on gender, in a race where abortion rights are not a determinative factor. 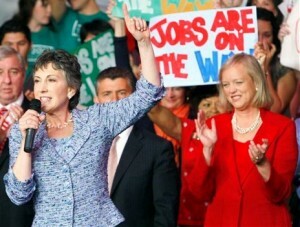 The 2010 Senate race pits the strongly pro-life Fiorina against the fiercely pro-choice Boxer. Since both are women, gender is likely to play even less of a role than usual. And Fiorina will have a tough battle, as no pro-life candidate has won at the top of the ticket (president, governor or senator) in California since 1988, when George Bush beat Michael Dukakis. The Whitman-Brown race is a different matter. “For a socially moderate, pro-choice woman like Meg Whitman, there’s some segment of the electorate that will take a closer look at her than they would if it were a white male with the same positions on the issues,” said political consultant Garry South, who guided Democrat Gray Davis to his gubernatorial victory in 1998 1994. Running against the pro-choice Jerry Brown, however, Whitman will likely find it difficult to woo Democratic women voters to her side, just as Kathleen Brown could not lure Republican women away from Wilson in 1994. The Feinstein-Huffington race suggests, however, that Whitman’s gender could help her among independent women who are not aligned with Democratic positions on other issues.